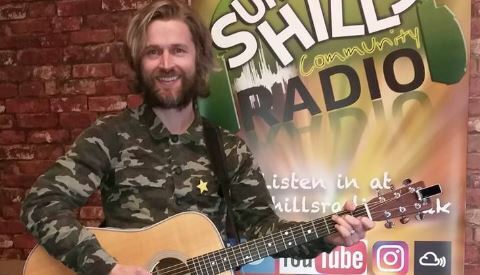 Blake Sonnet joined me in the studio for a live acoustic session with tracks from his new debut album and talked about his musical influences, how he finds the inspiration to the lyrics to his songs and recording a video for the track “Everyday”. Blake Sonnet is a hot new up & coming independent singer/songwriter, with the independent debut album release of ‘Middle Of Everywhere’. It is based on the concept of “wherever consciousness arises in the universe, it is always in the middle looking out into the vastness of time and space”. Being an independent release it is hard for an album to get noticed but followers of Blake Sonnet have created a small buzz on social media and reached his listeners, having over 1.2k likes on Facebook and 3k Followers on Twitter. The artists Blake Sonnet nu-folk pop inspired sound. His music is designed to be both uplifting and chilled out. The debut album ‘Middle Of Everywhere’ is now available to purchase or stream online.